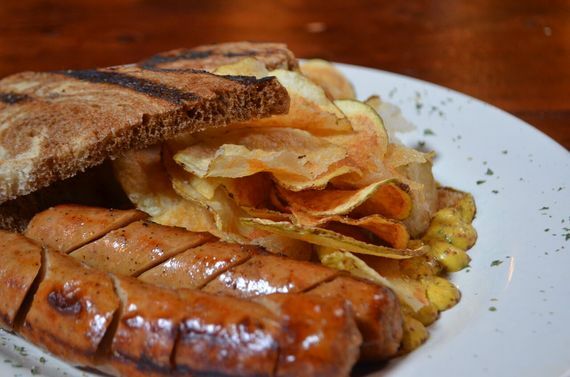 Located in the historic 1920s Bahnson House on "Millionaire's Row" and once used as the city's public library, Spring House enters its fifth year as one of Winston-Salem's fine dining restaurants wholly free of pomp while remaining genteel in the most disarming sense. 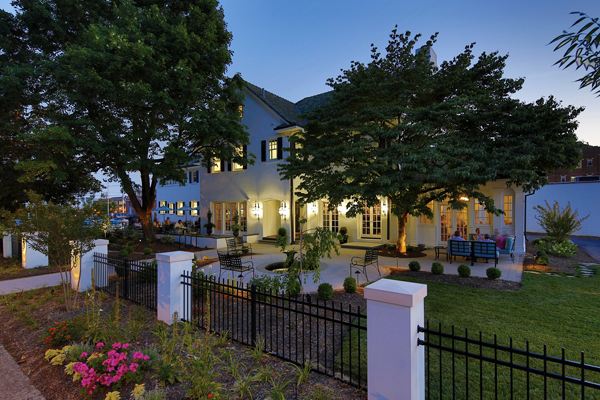 Owners Lynn Murphy and his wife, Lynette Matthews-Murphy, have infused a congenial hospitality in every detail and corner, including the beautiful Library Bar, the sun room, and, in good weather, tables outside on the spacious lawn. The place retains the look of a great house with broad staircases, French doors and fireplaces, white oak floors, and four upstairs bedrooms. Inside the kitchen there is a "Chef's Table" where chef/co-owner Tim Grandinetti displays his considerable showmanship in lavish multi-course dinners. Otherwise the regular menu is long and has something for everyone, each dish piled high with food and garnishes, from the house salad towering with juicy roast duck, caramelized onions, mushrooms, potato and goat's cheese ($25), to the shrimp, crab, and roasted corn beignets with a red beet sauce and horseradish condiment ($11.95). A dish called "The Colonel" is composed of crispy buttermilk fried chicken and "sawmill gravy" with smoked tomato and pimento cheese grits ($19.95), while the crusted pork chop ($23.95) comes with brown sugar whipped sweet potatoes, pickled shrimp and crab salad with smoked tomato rémoulade. There's not a little whimsy in attaching "Gourmet" to Mary's Diner, now six years in business, for while all the traditional no frills chairs and tables and the "sit-down-and-eat" ambiance are what you might expect, they are enhanced beyond anything you might imagine by vast murals by local artists of justified reputation, including Liz Simmons, Laura Lashley, Daniel VonSeggen, Jason Blevins and John Blackburn. On one wall is stretched the "Garden of Eden." On another "Culinary Warrior Women." Stars twinkle, colors pop, dinosaurs stroll with lions, and wit abounds. Mary's began on a smaller scale but business bloomed so well that they were forced to get bigger and offer even better. Breakfast is served six days a week, out of an old bank building in the burgeoning Arts District. 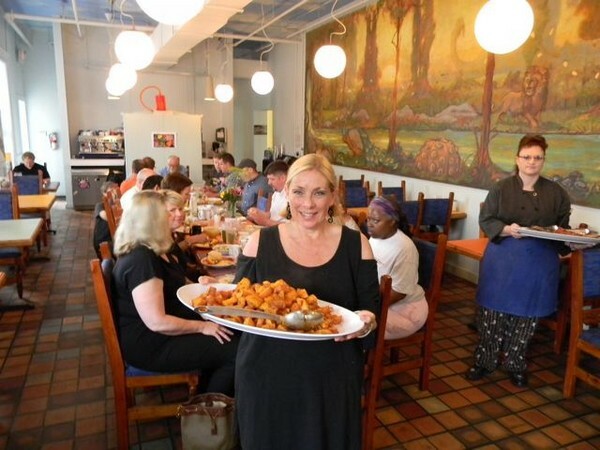 The Mary in question is Mary Haglund, and nothing goes in or out of that kitchen that she doesn't deem the best she can buy and serve, and do it at very reasonable prices: a square deal for a square meal. "Over the years, many people have found it hard to believe the food isn't rigged with some 'special' ingredient," she says, "Perhaps it's the LACK of strange ingredients that blows people's minds and taste buds." Whatever it is, I was enchanted with the place and the food, from the billowy "build your own" omelets to the plump breakfast burrito ($10.75) and the griddle-fried cornmeal cakes with thick-sliced bacon or sausage ($10.50). 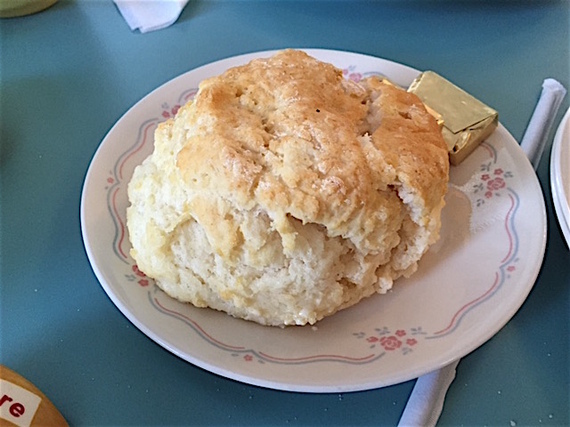 The biscuits at Mary's are knock-outs--big as a baseball, fluffy, buttery, they're light and airy but with just the right textural heft and that tangy hint of buttermilk. Pour on some pork gravy and you have a breakfast as good as any in the South ($10.50), and one to hold you till dinner. The grits, as you can guess, are simply cooked but taste of corn, topped with seasonal greens, tomatoes, two fried eggs and feta ($10.95). Down the bottom of the long menu Mary lists her purveyors, all from North Carolina, like Homeland Creamery Dairy Products from Julian, Ward's Happy Chicken Eggs from McLeansville, Sanford Milling Company Flour in Henderson, Plum Granny Farm Produce from Greensboro, King and Kranies Coffee from Winston-Salem. It would never occur to her to serve anything else, and her loyal clientele know that. 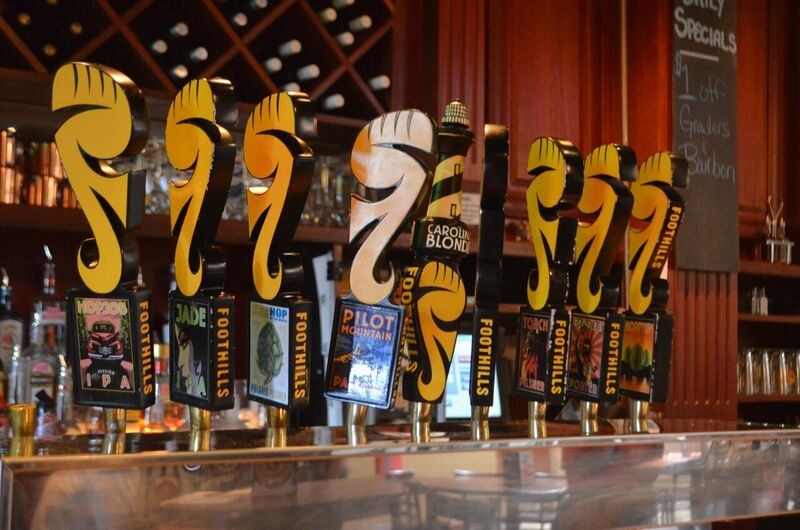 You can't get fresher beer than at Foothills (evoking the Piedmont) because right there is where it's made--they give tours--and as a brew pub they are as serious about their food as they are about their beer. In a big room flanked by the brewery and a good long counter behind which stand expert bartenders who pour dozens of their products with as much care as an Italian barrista makes a cappuccino. Each month Foothills features a special beer, which includes Sexual Chocolate in February, Hopjob Session IPA in May, Oktoberfest in August and Frostbite Black IPA in November. To go with such plenty, you sit down to a big table, with strangers if you care to, and chow down on fried pickle chips with Ranch dressing ($5.99), loaded-up Pub nachos ($8.99) with beer cheese, really delicious wings with three sauces ($8.99) and larger platters of pork ribs roasted in Carolina Cream Ale ($17.99). Bratwursts come with fresh sauerkraut ($14.99), and burgers taste the way burgers should--of first-rate, lightly compacted ground beef, with a choice of sensible toppings, which includes the Dirty South Burger with pimiento cheese, bacon, tomato and fried pickles ($12.99). Don't forget the fat, crispy, greaseless onion ring stack either ($5.99). By any stretch Foothills serves up damn good food, and the beer adds a great deal more pleasure to the reason you come here. I also applaud the fact that in a state that mindlessly allows citizens to carry guns into a bar, Foothills posts a sign saying they don't want you in there if you're packing heat. Of course, they got some nasty letters and boneheaded phone calls, but it's the protesters' loss for missing out on food and beer this good.